In November of 1988, J. Peter Atcheson, Director of Planning for the Corporation of the City of Brantford, wrote to the Historic Sites and Monuments Board of Canada requesting that it consider the Canadian National Railway (hereafter, CNR) Station at Brantford (Figure 1) for designation under the new Heritage Railway Stations Protection Act. The station, built in 1905, has been identified by the City as being of heritage value and Brantford hopes to take the opportunity presented by Bill C-205 to ensure its protection. This request is supported by the Brantford Heritage Committee. The placement of Brantford on the main line of the Grand Trunk Railway (hereafter, GTR) and the erection of its new station in 1905 reflected a short and singular period of expansion and prosperity in that company's troubled history, one which lasted from the mid-1890s through to the early years of this century. The GTR was formally incorporated in 1852 to build a railway from Toronto to Montréal.1 In time, with the addition of numerous lines, it would form an important link between Ontario and the Eastern seaboard. The GTR of Canada East was also incorporated in 1852 to build a line from Lévis to Trois-Pistoles, Québec and the recently completed St. Lawrence and Atlantic Railroad was purchased in 1853. The Montréal to Lévis line opened in 1854 and the Montréal to Toronto line in 1856. The Buffalo and Lake Huron Railway was leased in 1864, adding a line from Pt. Huron to Chicago. The Georgian Bay and Lake Erie Railways were acquired in 1881 and the Midland Railway in 1884. The 1884 takeover of the Great Western Railway added another 1450 km of track and additional links to the United States rail system were established with the International Bridge across the Niagara River and the St. Clair tunnel beneath the St. Clair River. Brantford's early decision to build its own line to Buffalo, New York brought it within the sphere of the GTR's expansion by 1854. In 1905, following the short recession of 1903-04, Rivers-Wilson recapitulated for the Board the financial career of the GTR over the preceding ten years.5 In 1895 the company could not earn its fixed charges and had no money for alterations or improvements. The decision was made, therefore, that it was crucial to improve methods of transportation. To that end, the mileage of double track was increased from 404 to 956. The inventory of rolling stock had been allowed to decline slightly but due to rebuilding (out of earnings) the average capacity per car had increased from less than 18 tons in 1894 to nearly 24 tons in 1904. The number of locomotives had remained essentially unchanged though their average tractive power had been increased by one third. The Grand Trunk Western had been virtually reconstructed and re-equipped, and new elevators had been built at Portland and on Georgian Bay. In financial terms the figures were encouraging—during Hays' tenure, the company's yearly gross revenues grew from £4,400,000 to about £10,000,000 (notwithstanding a 50% increase in the cost of labour), the GTR or its Pacific subsidiary had raised over £16,000,000 of new capital, and the market value of company securities had increased by £20,000,000. The prosperity of this decade was also reflected in the design and construction of numerous substantial new railway stations such as Ridgeway (1903), Grimsby (1902), Wiarton (1904), Petrolia (1903), and Brantford (1905). The rehabilitation of the GTR's physical assets, the reorganisation of its management and the restoration of its earning power were not Hays' only challenges or accomplishments. He was also instrumental in the construction of a rail line to the Pacific. In 1903, during this period of optimism, the GTR set up a subsidiary, the Grand Trunk Pacific, to build a transcontinental line which was completed in 1914.6 The move, however, was a financial disaster and largely responsible for the bankruptcy of the GTR in 1919.7 The Brantford station, which was built at the apex of this short period of prosperity, is a more substantial and elegant structure than its nearby contemporaries and stands as a testimony to the achievements of the GTR. The line did not live up to its promise and within months was operating in the red. Company promoters had neglected to consider the abundance of competing lines in southwestern Ontario.13 Furthermore, Brantford had assumed it would be selected as a transfer point on the Great Western, operating out of Hamilton. Instead, the line was built to Paris by way of Harrisburg, and Brantford was forced to construct a branch road to the main line at Harrisburg at a further cost of nearly $100,000.14 There, passengers were subjected to "annoying delays in ill-equipped waiting rooms,"15 an inconvenience which continued for nearly half a century until Brantford was placed on the main line of the GTR. In its new station, Brantford found a substantial and imposing symbol of its growing importance and future promise. 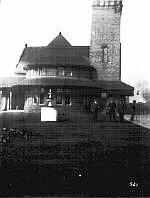 the station were highlighted in an article entitled "Brantford's New Station Reflects Greatest Credit on Both City and Company," which appeared in the Expositor of 30 September 1905. In approaching from the tracks the visitor would first enter the main waiting room, "a large, airy apartment," open and unobstructed.39 To the east of the building, overlooking the lawn and Market Street, was the ladies1 waiting room, and opening off the southeast corner of the main corridor/space was the porte-cochère where carriages drove up. The porch proper was joined by a cement platform leading right to Market Street. To the southwest corner of the main waiting room was the men's smoking room, and off this, the men's lavatories. There do not appear to have been any major structural changes to the building over the years, reflecting, in part, the continuity of its function. The main body of the building still contains the waiting rooms and ticket and baggage facilities, as well as office space. There are further offices located in the small, attached building to the rear of the station and the tower—once used for observation of the shunting and movement of cars—is no longer functional. In 1974 CIHB staff member Mathilde Brosseau prepared a report on the "Second Group of Grand Trunk Railway Stations—Original Eastern Section Stations and Stations From c. 1870 to c. 1920," from which the following comparative, analytical material is, in large part, drawn. On the basis of documentary and photographic evidence collected by CIHB staff in 1972-73, Brosseau concluded that there had been a tendency throughout the nineteenth century for the GTR to follow conservative, domestic precedent in station design, a procedure not at all reflective of the "technological revolution of which railroad transportation was a major witness. "45 The turn of the century, however, was a rich era for GTR station building, in which many standard plans, reflecting the prevailing picturesque aesthetic, were issued by the companyrs engineering office.46 Dominant characteristics of station design reflecting this attitude were the corner tower, a bold use of asymmetry, and a rejection of the principle of frontality. Stations were not designed to be seen from an axis and perpendicular to it, but were often built to be seen from many points of view. A new sense of plasticity was achieved with roofs adopting undulating patterns, pierced by decorative gables and turrets of various shapes. This was less common, however, in Québec than in Ontario. A basic design employing the "characteristic corner turret topped with a finial, a steeply pitched gable roof with umbrella eaves, and a front bay crowned by a larger gable"47 was found at Glencoe and Fergus, with variations at Whitby, Ridgeway (Figures 7 and 8), Welland Junction (Figures 9 and 10), Grimsby (Figures 11 and 12), Wiarton, and Petrolia (Figure 13). The first two decades of the twentieth century, prior to the Grand Trunk's being placed under the management of the CNR, saw "a flowering of small stations characterised in massing by a general return to horizontality and attenuation [sic] to details. "48 The Brantford Station, constructed in the very early years of this century, exhibits this horizontality, being long and low in appearance, but retains a somewhat old-fashioned, picturesque massing and eclecticism of detailing. These details make reference to several period-based stylistic elements, for example, the Romanesque round-headed arches of the porte-cochère; the fortress-like, medieval details of the squared tower and the five-sided turret; and the Chateauesque quality of the smooth wall surfaces and conical roof. Finally, a lingering Victorian love of polychromy is evidenced by the contrasting red brick and grey stone detailing. On the basis of these stylistic elements and tendencies, the Brantford station fits nicely into the framework provided by Brosseau and in that sense, may be seen as representative. It has the distinction, however, of being more substantial in size and lavish in decoration that the majority of her other GTR examples. The station is located on CNR lands, north of Wadsworth Street and west of Market Street, a very prominent location, as it forms the entrance to the downtown from the north and the major north-south artery—West Street—passes right by it.49 To the north of the station and tracks is a residential area containing some nineteenth century housing, which reinforces slightly the heritage character of the area.50 To the south and southeast, development is largely commercial in nature; to the south and southwest, across the tracks, it is light industrial.51 On the property itself, there is a large parking lot to the south of the building, a railway overpass on Market Street, a large lawn to the east, and a paved boarding and landing area and tracks to the north.52 Historic photographs (Figures 2, 3 and 4) indicate some minor changes have taken place since construction. The parking lot, for example, has been paved and a decorative fountain has been removed from the lawn in front of the station. The heritage importance of the station has long been recognised by interested local parties. In 1978-79 a summer student was hired to prepare a preliminary report on possible heritage structures in the city, at which time the station was identified as being of potential heritage significance.55 This work is now being formalised (with a system of rating incorporated) for the downtown area, activity which, it is felt, reflects a changing attitude on the part of the city toward its heritage properties and redevelopment.56 It is the city which has submitted the station to the Historic Sites and Monuments Board of Canada, with the full knowledge and support of the Brantford Heritage Committee. This action was prompted by the passage of Bill C-205 and not be any known or perceived threat to the structure. Without such a threat, there has been no call for demonstrations of public support, but it is the opinion of those asked (J. Peter Atcheson, Director of Planning and Dennis Jacobs, Senior Planner, both for the Corporation of the City of Brantford; and John Canning, Chairperson of the Brantford Heritage Committee) that the former GTR station is an important element of Brantford's built heritage which would be sorely missed and should be protected. ^ The Canadian Encyclopedia, Vol. II (Edmonton: Hurtig Publishers, 1985), p. 764. ^ A.W. Currie, The Grand Trunk Railway of Canada (Toronto: University of Toronto Press, 1957), p. 371. ^ The Canadian Encylopedia, p. 764. ^ C.M. Johnston, Brant County, A History 1784-1945 (Toronto: Oxford University Press, 1967), p. 51. ^ A Red Letter Day, Brantford Expositor, 30 September 1905, p. 1. ^ Brantford's New Station Reflects Greatest Credit On Both City and Company, (hereafter, Brantford's New Station) Brantford Expositor, 30 September 1905, n.p. ^ Telephone interview with John Canning, Chairperson, Brantford Heritage Committee, April 1989. ^ Telephone interview with John Canning. ^ Frederick H. Spier Dies, Michigan Architect and Engineer, Vol. 13 (March 1931), p. 44. ^ William C. Rohns, Monthly Bulletin of the Michigan Society of Architects, Vol. 25 (July 1951), p. 15. ^ Architect's Funeral Set (Spier's obituary), Detroit Times, 10 February 1931. ^ Mathilde Brosseau, Second Group of Grand Trunk Railway Stations—Original Eastern Section Stations and Stations from c. 1870 to c. 1920, Screening Paper "C," Historic Sites and Monuments Board of Canada, May 1974, p. k.2. ^ Gary N. Jacobs, Record For the Canadian National Railway Station House, Brantford, Ontario, unpublished background paper dated 1988, provided to the Historic Sites and Monuments Board of Canada by the City of Brantford.